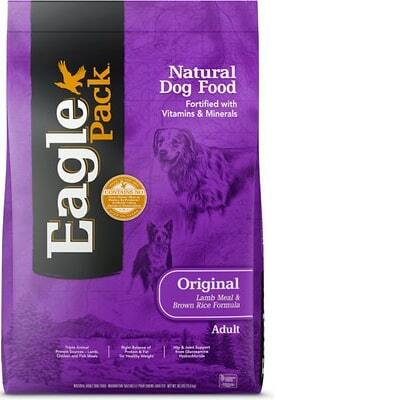 Eagle Pack Original Adult is a low-priced dry dog food with exceptional quality. This product has no controversial ingredients, which includes no artificial preservatives, colors or flavors. However, this food has a high amount of carbs, compared to its protein and fat, but excellent meat and fat quality. Eagle Pack has had no recalls and company was extremely transparent when answering our food quality questions. Watchdog Labs highly recommends this product. This food has a fair amount of protein but is high in carbs, which is lowering the fat content and making it less nutritionally balanced compared to other dog foods we evaluated. Carbohydrates are cheap so they keep the food’s cost low. They are nutritionally useful to dogs in the right amounts, however, high amounts of carbs can reduce the much-needed meat-based protein and fat content. Lamb Meal, Oatmeal, Ground Brown Rice, Dehulled Barley, Chicken Fat (Preserved with Mixed Tocopherols), Chicken Meal, Brewer's Dried Yeast, Tomato Pomace, Anchovy and Sardine Meal, Rice, Flaxseed, Potassium Chloride, Vitamins [Vitamin E Supplement, Niacin, Vitamin A Supplement, Ascorbic Acid (Vitamin C), Thiamine Mononitrate, D-Calcium Pantothenate, Pyridoxine Hydrochloride, Riboflavin, Vitamin D3 Supplement, Biotin, Vitamin B12 Supplement, Folic Acid], Minerals [Zinc Proteinate, Zinc Sulfate, Iron Proteinate, Ferrous Sulfate, Copper sulfate, Copper Proteinate, Manganese Proteinate, Manganese Sulfate, Sodium Selenite, Calcium Iodate], Taurine, Calcium Carbonate, Mixed Tocopherols Added to Preserve Freshness, Inulin, Glucosamine Hydrochloride, Dried Enterococcus Faecium Fermentation Product, Dried Bacillus Licheniformis Fermentation Product, Dried Bacillus Subtilis Fermentation Product, Dried Aspergillus Oryzae Fermentation Product, Dried Trichoderma Reesei Fermentation Product, Dried Rhizopus Oryzae Fermentation Product, Dried Lactobacillus Acidophilus Fermentation Product, Dried Lactobacillus Casei Fermentation Product, Rosemary Extract, Green Tea Extract, Spearmint Extract. The average dog food we reviewed has 39 total ingredients, with 1 controversial ingredient. This product does not have any controversial ingredients which is great to see. Barley is a type of grass and a cereal grain. It is a source of calories and several nutrients, including protein, dietary fiber, B vitamins, niacin and various minerals. Barley provides carbs, energy, fiber and other healthy nutrients for dogs. Barley is generally a healthy dog food ingredient. Dehulled means that the outer shell of the barley has been removed. There are no controversial ingredients in this Eagle Pack food, well done. Eagle Pack manufacturers this product in the United States. This food uses named meat sources: lamb meal, chicken meal, as well as an anchovy and sardine meal. This level of detail is great, it shows you the species the ingredient comes from which indicates a higher quality. The same goes for the two fat sources they list chicken fat and flaxseed. Both identify the species and plant. 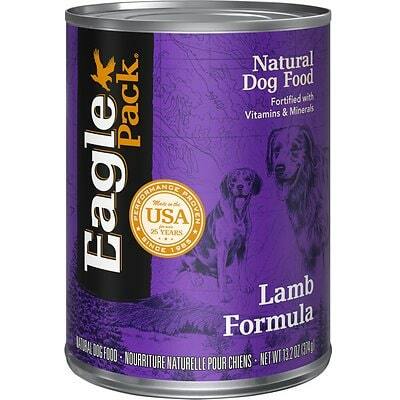 This Eagle Pack product does not have any controversial preservatives. These preservatives serve an important purpose, which is to prevent food from spoiling. However, we consider 11 artificial preservatives controversial because of their potential link to cancer and other serious health conditions. None are used in this food, excellent. This brand does not have any dog food recalls which is great to see. Eagle Pack is part of the Berwind Corp, (WellPet) which includes the brand Wellness. An email to Wellness was responded to in only 2 days. An additional email was received that suggested the responses to the Wellness email should be applied to all Wellpet Brands. There was a round of follow up emails to clarify some of the questions which were also responded to quickly and completely. We do have a PhD Animal Nutritionist on staff. His name is Dr. Mark Fink. We have a product development team that consist of food scientist, a DVM and our Animal Nutritionist. The name of our Animal Nutritionist is Dr. Mark Fink and our DVM is Albert Townshend. The rest of our product development team is a group that typically do not deal with the public. Since we follow AAFCO nutritional guidelines AAFCO feeding trials are not required. We do our own feed testing for digestibility, stool output, skin & coat, and palatability. Our manufacturing facilities are not open to the public. We own our dry food facility, WellPet Operations, located in Mishawaka Indiana. Co-manufacturers are listed above in question above. Our Wellness ingredients are primarily sourced from North America. WellPet has one of the most strict sourcing criteria of any pet food manufacturer. All ingredient suppliers, whether domestic or international, need to meet certified nutrient levels and be manufactured in quality audited facilities. While there are many high quality ingredients available in the U.S., in some cases there is not a readily available U.S. supply. For example, our Venison, Lamb, Rabbit and Salmon Meal are sourced internationally from New Zealand, Australia, Italy and Chile respectively. Specifically for Chinese ingredients, we do source our Green Tea Extract, Mixed Tocopherols and may source some our vitamins and minerals from China. We feel that we have the appropriate quality programs in place at all our vendor locations and feel safe and secure with all the ingredients we source, whether they are sourced locally or globally.